I confess that I had trouble connecting to the theme, “Connected” (pun intended!). I had several ideas, but most faded away; I just couldn’t seem inspired to work them out. The one idea that stuck with me was the notion that as textile artists, we are connected in a vast network of makers – those present, those who have gone before, and those to whom we’ll pass our torches. At the same time, as an international group – 15 x 15 – we are connected not only technologically but also through that same shared interest in textile arts. This train of thought lead me to the idea of actual connectivity in fabric and stitch, whether through knitting, weaving, quilting or sewing. I hadn’t time to explore the scope of these crafts in one modest piece, so I took the aspects of weaving and quilting as my focus. I wanted to create something like a simple nine-patch – but with a woven appearance. I selected 5” charm squares that had been part of a collection of hand-dyes created by my friend, Annette Johnston of Red Deer, Alberta, when she had her business, “Nature’s Colours”. How to weave 5” squares?! They were so colourful; the piece seemed to insist that I use them instead of going for yardage. Around this time, researching another piece, I stumbled over a “fused weaving” technique in the book Drawn to Stitch by Gwen Hedley (Interweave Press 2010) – in her chapter on [back]grounds. I was on my way. I began by selecting two warm colours – yellows-to-gold and red-orange-to-wine – and gradients of a complementary colour — blue. 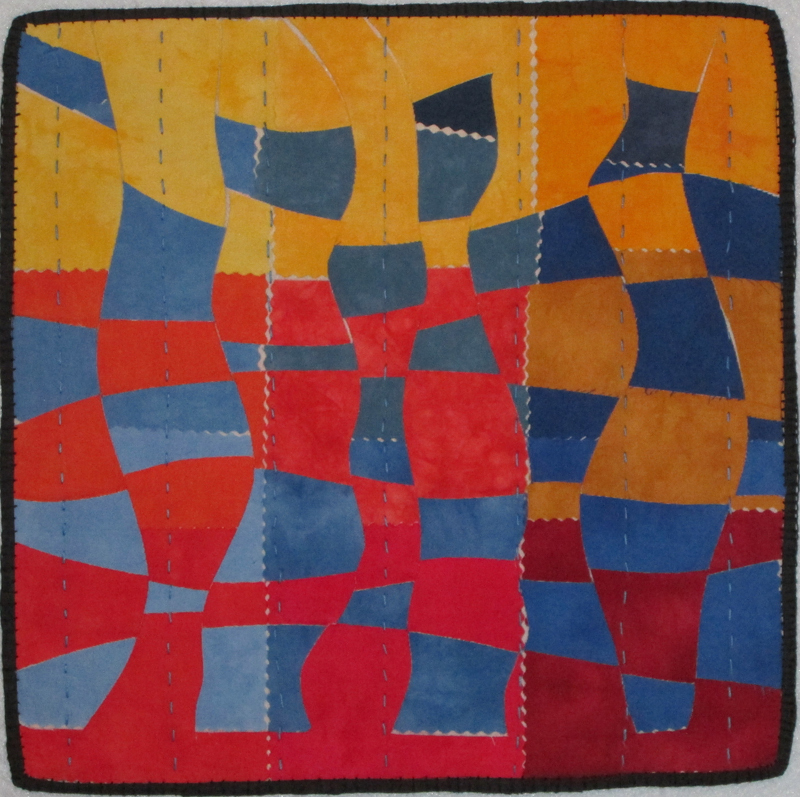 I fused the squares on light muslin – yellows through reds on one piece; blues on the other. Another layer of fusible web was applied to the back of the muslin pieces. Started about 1” from the top of the yellows/reds piece, I sliced curvy lines through to the bottom. I then sliced the blue sheet completely, again using curvy lines. I removed the backing paper from all the pieces. 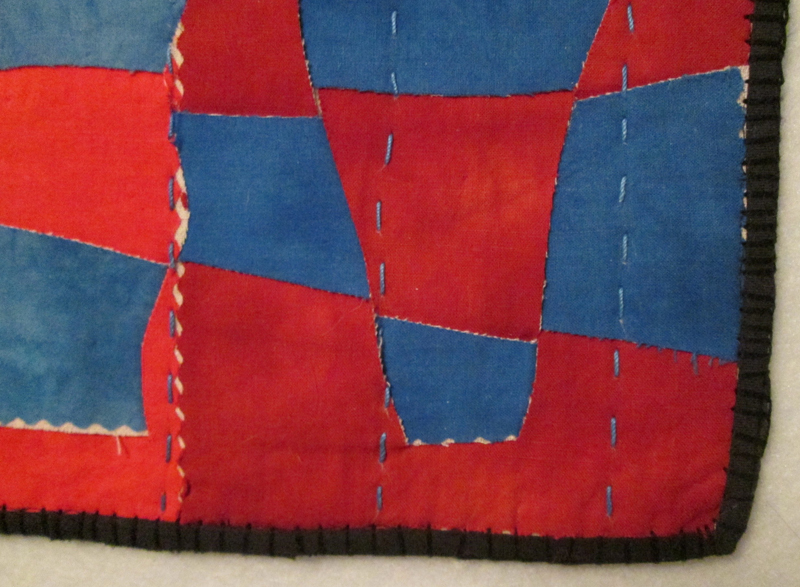 The yellows/reds piece was then laid on thin batting, and the blue slices woven through it. When I had a look that I liked, the entire piece was pressed to fuse it together. I backed the piece with a commercial cotton that quite co-incidentally is printed with curvy lines. 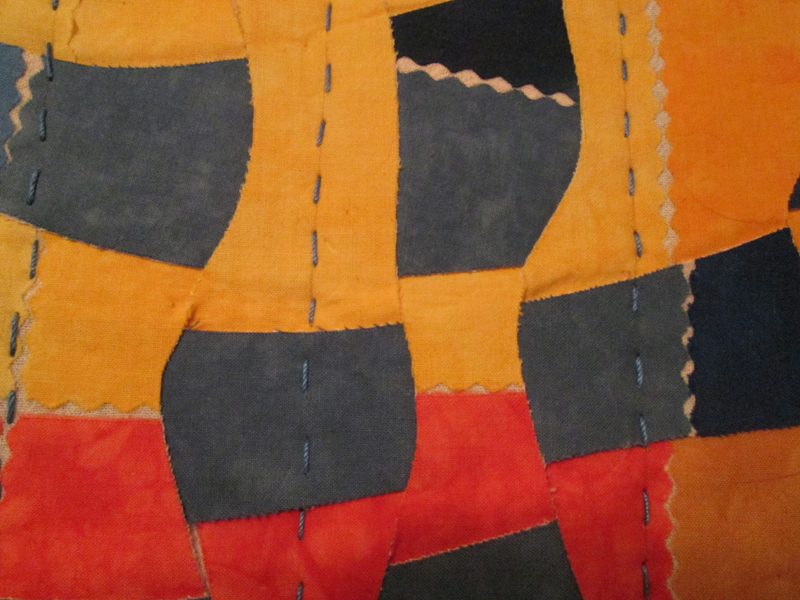 I then hand “quilted” it using a hand-dyed perle cotton (#8 weight) and an upholstery needle, as it was by now quite stiff due to two layers of fusible web! At this point the process came to a halt. As it was already 15” square – how to finish it? I thought of a wide satin stitch but was discouraged by the thought of how stiff it was. I applied a black synthetic ‘silk’ cording but it didn’t cover the edges neatly, so…I over-laid it top and bottom with black fusible narrow bias tape, the kind often used for a “stained glass” effect, and further secured this with hand-stitch, using 3 strands of cotton floss and a wide blanket stitch. This is an odd piece for me, being so bright and geometric; what to call it? I hunted through my thesaurus for synonyms for “connected” and came up with what I think is the perfect fit. I hope you’ll agree!